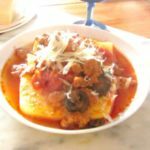 We’re still busy, the weather is giving me a rough time and I’m not feeling well – so I’m still looking for uncomplicated, warm, cozy meals (that lend themselves to reheating.) 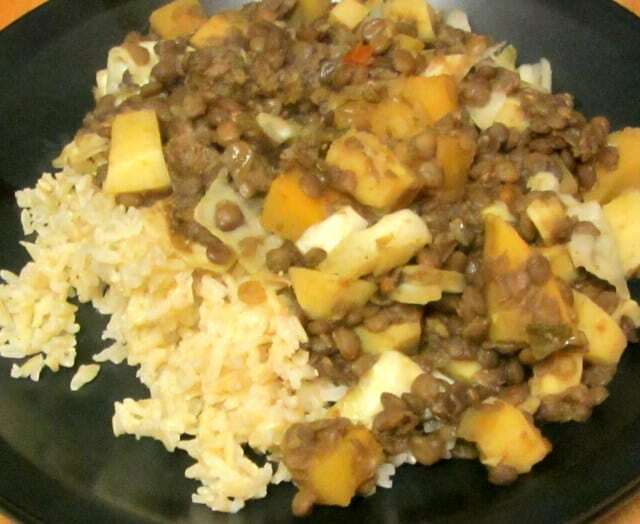 I got rutabagas and parsnips from Greenmarket, and I love them with lentils – sweet, earthy flavors that blend well, to my taste – so made a good pot of root vegetable and lentil stew. This time, I decided to cook the lentils on the side, and add them towards the end, so first I rinsed 2 cups of lentils and put them with water to cook. Other beans would work well, too (though they’d take longer to cook – but you could add canned beans at the point when I add the lentils.) I particularly like this flavor combination, though. And I had some ground beef, and decided to add that, for the beefy taste and a slight protein boost. I only used 1/4 of a pound, though – you can either use more, or leave it out all together, if you prefer – each will be slightly different, but both variations will be good. I broke up the meat and dropped it into a heated pan. I stirred it and broke it up further, and let it brown. Then, as it released a little fat, I added some chopped onion and hot pepper. Now – amounts… I usually say “A small onion” because that’s what makes sense in a recipe – but I don’t always have a small onion – this was actually 1/4 of a rather large onion… (I put the other pieces in a vegetable keeper, and it works quite well.) Equally, I’ll write “1-2 hot peppers, chopped” because that’s what makes sense to someone just looking at the recipe – but what I used was a chunk of my pre-sauteed frozen peppers from last summer – I don’t have a fresh raw pepper at this time of year. 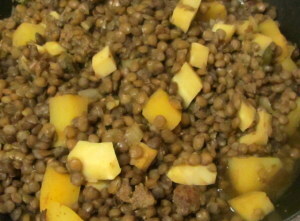 Then, as they all cooked, I also added a teaspoon of ground cumin, which again goes very well with lentils. Then the vegetables. 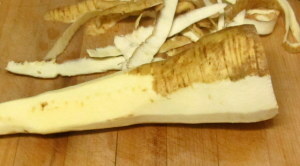 I peeled the parsnip – in theory, I could just scrub it, like a carrot – but this one the skin seemed a bit tough and dry, so I used a swivel blade peeler, then cut it up. Rutabagas definitely need peeling – if you got it from a supermarket it’s probably waxed, of course, and even if you bought it unwaxed the skin is very tough. I cut half of it, and decided that was enough – put the rest away in a vegetable keeper. Carrots would have worked, too. 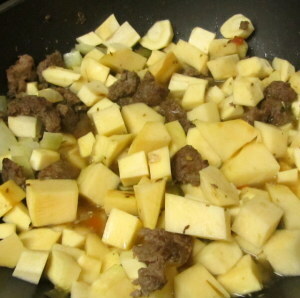 I stirred the cubed vegetables in with the meat and onion mixture, and then added a cup of vegetable broth. (In this case, I actually added a cup of water and a spoonful of Vegetable Base… If I’d had chicken broth handy I probably would have used it.) If the broth had no salt, I’d add a pinch of that. Then I set it on a low simmer for about half an hour. And there we had it. Dinner – and two lunches… once just reheated, and once thinned with broth into soup. Nothing fancy, but a solid, warming, good December meal. 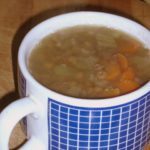 A comforting, warming root vegetable and lentil stew, with sweet, earthy flavors - cheering on a cold, wet day. Break up meat and drop it into a hot pan. Stir to crumble and brown. 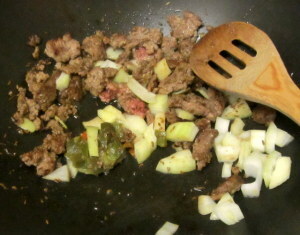 Add onion, and peppers, and saute until soft. 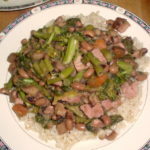 (If you choose to omit meat, use a little oil in the pan.) Add cumin, stir. Once meat is brown and onion and pepper is soft, add the cubed vegetables and broth. Stir, cover, and simmer half an hour. Stir the lentils into the vegetable mixture. Add the cabbage, stir it in, cover the pan and cook 5-10 minutes, until done to taste.